by building specific buildings (the Church, the Statue,..). d) exclusive use of some buildings. Each line is divided into 5 columns with an increasing power (from the left to the right). For each line, the first two columns are available from the start of the game. Columns 3 and 4 are available after the count of the Dungeon section (even if players have already started building in the next section). Column 5 is available after the count of the Walls section (even if players have already started building the next section). Several players may be on the same space at the same time. Whenever a player earns a favor, they must choose a line at once, and, if it is possible, advance their marker to the right. Then, the player can use one of the effects provided on the chosen line, between level 1 and the level currently indicated by the marker. 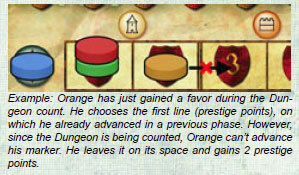 The player can advance the marker to level 2 of a given line, Caylus for 2 players Simplified favor and choose to use the effects of level 1. It is not possible to advance your marker on a given line and use the effect of another line. Once level 5 has been reached, the marker can't go any further, but the player can still choose the line and take advantage of the effect of their choice. 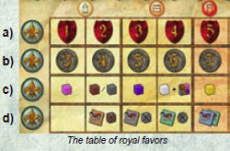 If a player gains several favors during the same phase (for instance, during a count or when the monument is built), the favors must be used on different lines. So, it is impossible to gain more than 4 favors in a phase. The player gains between 1 and 5 prestige points, depending on the column the marker is in (it is useless to activate a lower column). The player gains between 3 and 7 deniers, depending on the column the marker is in (it is useless to activate a lower column). This line allows you to use the effect of some construction buildings directly. To use the effect of a given building, it doesn't have to be on the board (for instance, you can use column 3 even if there is no mason on the board). 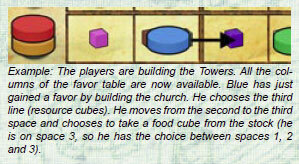 Buildings are constructed according to the rules of phase 5.
column 2 (carpenter): the player can build a wood building by paying 1 wood cube less. column 3 (mason): the player can build a stone building by paying 1 stone cube less. column 4 (lawyer): the player can transform one of their buildings or a neutral building into a residential building by paying only 1 cloth cube. 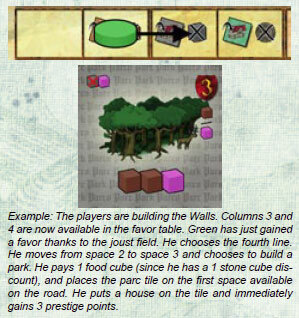 column 5 (architect): the player can build a prestige building on one of his residential buildings.